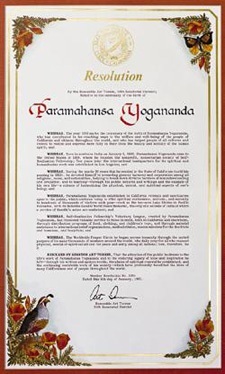 We support many local and national organizations that provide food, clothing, shelter, medical attention, and educational opportunities to, among others, the poor and homeless, children, the elderly and persons with disabilities, war veterans, and victims of natural disasters. The SRF Voluntary League also collects and distributes items such as food and clothing for those in need. YSS has also worked closely with the Missionaries of Charity, established by Mother Teresa of Calcutta, on several projects involving medical assistance, housing, and new wells to provide clean water to "the poorest of the poor." 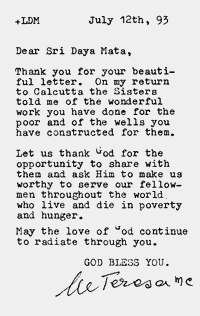 Below is one of the letters received from Mother Teresa expressing gratitude for the assistance and support given by YSS.